Mide’s range of Slam Sticks is available in 3 variants: the Slam Stick C; Slam Stick X; and the Slam Stick S. Check out this selection infographic. Filters, battery, storage, and data acquisition electronics. The essential difference between the products is the accelerometer embedded in the data recorder. Each variant comes with a triaxial capacitive DC MEMS accelerometer. This accelerometer is great for general purpose testing - but it has some limitations. Specifically, its sample rate (limited to 3,200 samples per second per axis), resolution, filtering, and noise levels aren't optimal for higher-end engineering applications. In addition to the triaxial capacitive DC MEMS accelerometer, the Slam Stick X has a triaxial piezoelectric accelerometer. This accelerometer offers a higher data quality, wider measurement range options, 5th order Butterworth anti-aliasing filters, and a maximum sample rate of 20,000 samples per second per axis. Piezoelectric accelerometers are the most popular because of their versatility but they have two disadvantages. For one, they are AC coupled which means that it can’t measure static accelerations (like gravity) and generally can’t measure slow (<2 Hz) vibrations (there are some types meant for seismic applications that have a lower frequency response). Their charge amplifier can also become saturated during high frequency and amplitude shock events which will prevent the accelerometer from measuring anything for a second or two as the amplifier discharges. Thankfully in the Slam Stick X, having the added triaxial MEMS accelerometer helps offset these disadvantages of piezoelectric accelerometers. The Slam Stick X is available in two enclosures: the standard polycarbonate (plastic), or aluminum. The aluminum enclosure provides improved stiffness that results in a higher frequency response of the embedded accelerometer; making it ideal for shock testing, and high frequency vibration testing. It is also helpful in applications where accuracy and durability are paramount and semi-permanent mounting (for instance bolting or epoxy adhesive) is available. In addition to the triaxial capacitive DC MEMS accelerometer, the Slam Stick S has an added triaxial piezoresistive accelerometer. This accelerometer offers similar advantages as the piezoelectric: a higher data quality, wider measurement range options, 5th order Bessel anti-aliasing filters, and a maximum sample rate of 20,000 samples per second per axis. But they have the added benefit of being capable of measuring static accelerations and low-frequency vibrations. They also have internal gas damping to widen the dynamic range of the accelerometer and prevent it from reaching its internal resonance. 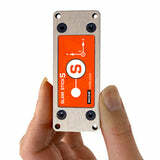 These accelerometers are increasingly becoming more popular but they are relatively expensive, making the Slam Stick S Midé’s most expensive product variant. For more information on accelerometer types and what’s best for your application refer to Midé’s blog post on Accelerometer Selection.